Yowsa… spicy! « You know… that Blog? If you’ve been around a while, you may know that I’m not a fan of spicy food. Or… maybe you don’t. No matter! I’m not, nor is the Hubby or the girls. So why, then, am I sitting here with my mouth on fire, continuing to shovel this stuff into my face?? Because it is SO SO good, that’s why. Sweet, spicy… and bloody addictive. 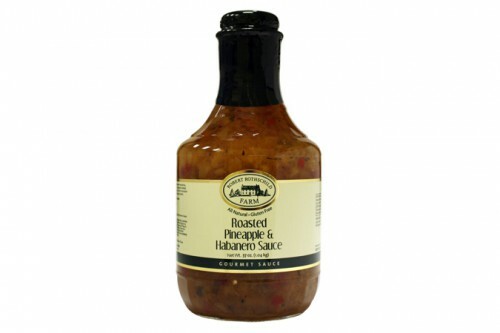 Say it with me now; Roasted Pineapple Habanero Sauce. Doesn’t that just make your mouth water?? I got it at Costco after I had some at my folks’ place a couple weekends ago. This stuff is good with just about anything! Use it as a salsa with chips, as a marinade, a burger condiment, over meat or fish on the BBQ or in the oven, and even in the crock pot! So versatile. I purposely haven’t looked at the nutrient panel on the bottle, because I just don’t want to know how much sugar is in it. A lot, I’m sure. I did find a recipe online today though, so I’m going to be making it when we get through this bottle… which won’t be too long. Please head on over to see Lori at “Our Forever House” and get her spot-on recreation of this wonderful, addictive stuff. Say Hi for me! How are you spending your long weekend (assuming you’re looking at one this weekend)? I’m so lucky… we’re cleaning out our garage. Yes, that was sarcasm. Yeah yeah, I know it’s necessary, and we’re running out of time to get it done – the Teen will need a vehicle to commute back & forth to college come September, which will mean an additional vehicle in our household – but geez. I could think of so many different ways I’d rather spend a glorious, sunny long weekend. You see… it’s JAM PACKED with boxes from our move. Yes, I realize that was 10 months ago. Yes, I know we should have dealt with it before now. Get off my back, will you?? Well, maybe it won’t take the whole weekend. A girl can dream, right? Posted in Cleaning, Food and Recipes , costco, recipe, Roasted Pineapple Habanero Sauce	| Comments Off on Yowsa… spicy!